Delivering outstanding tyres for all aspects of performance in all conditions, Yokohama tyres are a range that focuses on delivering the perfect tyre for high performance vehicles that also has an emphasis on performance and fuel efficiency. Both on and off the track and from everything from saloon cars to tuned performance vehicles, Yokohama tyres are known for their quality. The main focus of the tyres' manufacturing is on quality of build, along with the likes of reliability and durability. They are recommended by a number of different car manufacturers, including Audi, Lexus, Honda and Toyota. 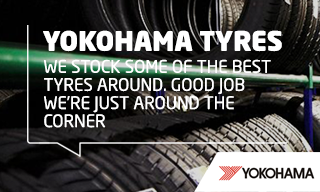 ATS Euromaster is proud to provide Yokohama tyres throughout the UK at our service centres. For more information on available tyre ranges, use the 'Find Your Tyres' section of our website, or visit a service centre, where our experts will help select the right tyre for your vehicle and ensure that they are fitted correctly. The V103 is the ideal tyre for high-performance premium cars and SUVs. With its high grip compound with a low dependency on temperature, the tyre offers the perfect mix of sport and comfort for drivers. For anyone motoring in extreme weather conditions, the V103 is an ideal tyre thanks to its exceptional handling and braking performance. The wider size range and the innovative ADVAN asymmetric tread design is perfect for premium and tuned vehicles, with unique construction for high powered, high speed and high loading stress. Characterised by a high level of driving comfort and a low nose level when on the road, the V108 is a performance tyre built for use in the winter months. Thanks to its lamellar structure in the build of the tyre and the new silicone compound, the tyre shows excellent handling in any weather condition throughout winter. Offering strong performance on snow and ice and resistant to aquaplaning, it is the ideal tyre for premium car drivers throughout this season.